Simply said...if you were not at SKIF International on July 17, 2014, you missed an amazing night to celebrate the new home of Michael Drummond's extravagantly delicate knitwear. Immediately walking up to the space, you are hit with the mannequins draped in woven designs that are so intricate, much like how Charlotte would have made her webs. Guests, such as ALIVE Magazine's fashion editor Sarah Stallman, Project Runway-alum Laura Kathleen and Brainchild Events and Rock Uniform owner Dwight Carter, were greeted by the enormous SKIF International workspace made famous by Nina Ganci's knit sweaters from 'The Matrix'. 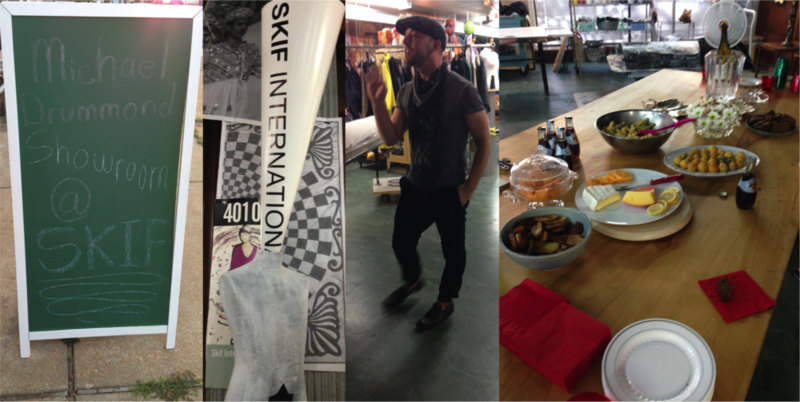 Michael Drummond and the SKIF crew even went out of their way to cook and prepare delicious homemade snacks like vegan macaroni and cheese to dazzle the tastebuds along with the fashion senses. Once you move into the showroom, you can not help but touch and feel and stand with your bottom jaw on the floor. The careful construction and attention to detail really elevate Michael Drummond's unique design aesthetic. Outside of knitwear, Michael Drummond also brings his brilliant RTW leather harness work so that even in St. Louis you can shop one of the hottest trends at the moment! Make sure to get out to the Hill and find that amazing piece to add to your own wardrobe!! !